But possibly not quite in the way you imagined I meant! Yesterday, my post included a fascinating essay from Patrice Ayme, 40 Billion Earths? Yes & No. The immensity of the universe and what it means for Planet Earth. Sarah Crompton reviews the first episode of Brian Cox’s latest series, Wonders of Life (BBC Two). When it comes to presenting styles, Professor Brian Cox is hard to keep still. There isn’t a beach he won’t feel compelled to stroll on, a mountain he won’t climb, or a river he won’t jump into. And what does he carry in that bag? Once you got beyond these irritating stylistic tropes, however, Wonders of Life (BBC Two) was Cox at his absolute best, using his natural enthusiasm to communicate complicated ideas in very simple ways. He decided, for example, to show us his own DNA by spitting in a test tube – and missed. “A physicist doing an experiment,” he giggled, with unforced charm. But when he actually succeeded, those little strands of white that you suddenly see brought everything he subsequently said to life. He was brilliant at explaining his thesis, which was actually about the second law of thermodynamics, so not that much of a doddle to grasp. If I’ve got it right, what Cox thinks is that life itself may have been the inevitable consequence of the laws of physics and can be explained in the same terms as we explain “the falling of the rain and the shining of the stars”. The programme’s sophisticated use of graphics, and Cox’s patient repetition of his conclusions, all added to the sensation that this is a series that is actually going to tell you something. For the BBC to unveil both this and The Story of Music over a single weekend reveals a pretty impressive commitment to public service broadcasting. Long may it last. One of the clear messages that comes from the program is the fact that our universe and the formation of life are intimately connected. That the ‘big bang’ some 3.2 billion years ago, the huge interstellar gas clouds, the formation of the carbon atom and the subsequent long-chained molecules, the collapse of those gas clouds to form suns and planets, the start of life, evolution through natural selection to ever more complex life forms, and on and on and on were and are inevitable. The science is clear. There is nothing mystical about it. Yes, of course, anyone with half-an-ounce of sensitivity will be in awe of it all; the power and beauty of nature and of the natural world. As another BBC television programme explained, the universe is bigger than beyond imagination. That was from the BBC Horizon broadcast of August, 2012: How Big is the Universe? Here’s the trailer for that programme. Stay with me a little longer! Just look at the following image. This image of the Andromeda galaxy, taken in infrared and X-ray, consists of over a trillion stars. The detailed Spitzer Space Telescope view above features infrared light from dust (red) and old stars (blue) in Andromeda, a massive spiral galaxy a mere 2.5 million light-years away. In fact, with over twice the diameter of our own Milky Way, Andromeda is the largest nearby galaxy. Andromeda’s population of bright young stars define its sweeping spiral arms in visible light images, but here the infrared view clearly follows the lumpy dust lanes heated by the young stars as they wind even closer to the galaxy’s core. Constructed to explore Andromeda’s infrared brightness and stellar populations, the full mosaic image is composed of about 3,000 individual frames. Two smaller companion galaxies, NGC 205 (below) and M32 (above) are also included in the combined fields. The data confirm that Andromeda (aka M31) houses around 1 trillion stars, compared to 4 hundred billion for the Milky Way. ESA astronomers say that for every ten far galaxies observed, a hundred go undetected. Astronomers estimate that there are between 100 billion and 200 billion galaxies in the known universe. A single galaxy such as the Milky Way contain upwards of 200 billion normal stars. About 75 percent of all stars in the Milky Way are less than half as massive as our Sun. In the universe at large, the majority of galaxies are classified as dwarfs, each with less than a few hundred million stars. 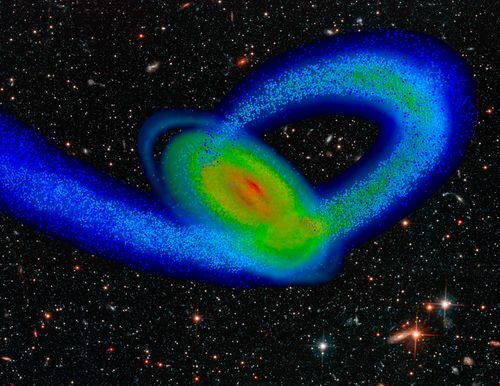 The image above is a computer simulation of a colliding dwarf galaxy triggering the formation of the Milky Ways spiral arms. The largest project ever undertaken to map out the Universe in three dimensions using ESO telescopes has reached the halfway stage. An international team of astronomers has used the VIMOS instrument on the ESO Very Large Telescope to measure the distances to 55,000 galaxies as part of the VIPERS survey (VIMOS Public Extragalactic Redshift Survey). This has already allowed them to create a remarkable three-dimensional view of how galaxies were distributed in space in the younger Universe.This reveals the complex web of the large-scale structure of the Universe in great detail. The light of each galaxy is spread out into its component colours within VIMOS. Follow up analysis then allows astronomers to work out how fast the galaxy appears to move away from us — its redshift. This in turn reveals its distance and, when combined with its position on the sky, its location in the Universe. Millions of galaxies, trillions of suns, inconceivable numbers of planets. Please pause and let the numbers sink in. Now back to that Wonders of Life BBC series, during which Professor Brian Cox, said, “that it is inconceivable that there isn’t life elsewhere, that life is not present on countless other planets circling countless other suns …“. In other words, if mankind is so intent on ‘fouling our nest’ on this most beautiful of planets, so what! In the bigger scheme of things, it matters not. Find that tough? Then go and hug a dog and enjoy the moment. For tomorrow may never come. … that if we don’t love our planet with all the ardour and passion of a teenager’s first romance, all those other loves in our lives will ultimately become irrelevant. In researching for that essay, I visited Carl Sagan’s website, a rich source of information and materials for anyone interested in the far Cosmos right down to our future on this planet. Just a little over three months ago, I wrote a post with the title of Carl Sagan with the objective of promoting his beautiful and awe-inspiring film called Pale Blue Dot. Back to the present. On YouTube I came across this short video that seems so relevant to our need to love the only planet we have. Carl Sagan explains the immensity of space and time in this clip is from Carl Sagan’s Cosmos episode 8, “Journeys in Space and Time. “Those worlds in space are as countless as all the grains of sand on all the beaches of the Earth. Each of those worlds is as real as ours. In every one of them, there’s a succession of incidence, events, occurrences which influence its future. Countless worlds, numberless moments, an immensity of space and time. It would be so easy to stay with this theme for a very long time, perhaps to the end of one’s mortal days. Anyway, my topic has taken sufficient shape for me to conclude with this article and then leave these ideas with you, or just out there in the universe. The ‘shape’ being that whether the facts about the way we treat Planet Earth depress you, or whether taking a mystic, spiritual view is more your scene, it’s up to you. Let’s recap. The first article was to show that there are very strong and valid reasons to take an incredibly dim view of where it’s all heading. 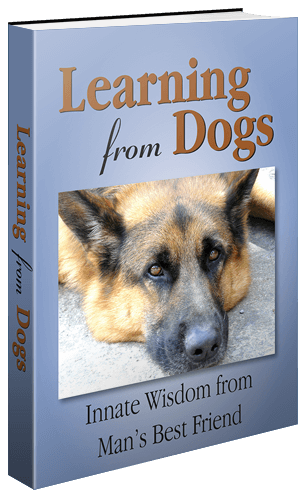 In fact, those that stay with Learning from Dogs over the weeks, you hardy lot!, will know that the premise that we, as in mankind, are well and truly in the midst of a massive transition, unlike anything ever experienced before, is an idea that crops up here every so often. This piece on the 22nd is just an example, and there are many more articles resonating around this theme on the Blog. OK, to the point of this article! The BBC have been showing the most beautiful episodes in recent weeks from a massive production hosted by Professor Brian Cox- The Wonders of the Universe. Here’s the BBC trailer. Here’s a recent piece from the British Guardian newspaper, I think written by Brian Cox, the presenter of the series. The universe is amazing. You are amazing. I am amazing. For we are all one. Everything we are, everything that’s ever been and everything that will ever be was all forged in the same moment of creation 13.7bn years ago from an unimaginably hot and dense volume of matter less than the size of an atom. And that is amazing. [Understatement! Ed.] What happened before then in the Planck epoch is a matter of conjecture; we lack a theory of quantum gravity, though some believe the universe was formed from a collision of two pieces of space and time floating forever in an infinite space, but I feel I’m losing you at this point, which isn’t so amazing. Time feels human, but we are only part of Cosmic Time and we can only ever measure its passing. As I stand in front of the great glacier that towers over Lake Argentino, time seems to almost stand still, yet as I explain the effects of entropy in the Namibian desert as sandcastles crumble around me, you can see that the transition from order to chaos can happen almost in the blink of an eye. One day, perhaps in 6bn years, our universe will stop expanding, the sun will cool and die, as all stars must, and everything will collapse in on itself, back into a black hole singularity. I leave you with this last thought: that we, too, will only really die when the universe dies, for everything within it is intrinsically the same. Brian Cox takes an almost mystical perspective of the size of the universe and the almost unimaginable number of stars and planets it contains. It’s a great big Universe out there, with a huge numbers of stars. But how many stars are there, exactly? How many stars are there in the Universe? Of course it’s a difficult question to answer, because the Universe is a vast place and our telescopes can’t reach every corner to count the number of stars. But we can make some rough estimates. Almost all the stars in the Universe are collected together into galaxies. They can be small dwarf galaxies, with just 10 million or so stars, or they can be monstrous irregular galaxies with 10 trillion stars or more. Our own Milky Way galaxy seems to contain about 200 billion stars; and we’re actually about average number of stars. So an average galaxy contains between 1011 and 1012 stars. In other words, galaxies, on average have between 100 billion and 1 trillion numbers of stars. Now, how many galaxies are there? Astronomers estimate that there are approximately 100 billion to 1 trillion galaxies in the Universe. So if you multiply those two numbers together, you get between 1022 and 1024 stars in the Universe. How many stars? There are between 10 sextillion and 1 septillion stars in the Universe. That’s a large number of stars. Even if one writes down in longhand the number, 1022 , as in 10,000,000,000,000,000,000,000 it still has no real meaning whatsover. That, of course, does not even get close to estimating how many planets there are out there. Let’s say, just as a muse, that each sun only had a single planet. Let us also continue this musing and say that only one in a billion planets had life on it. In other words, if we divide 1022 by a billion, we still get the eye-watering result of there being 1013 or, longhand, 10,000,000,000,000 planets with life forms. That’s 10 trillion, by the way! OK, cut it down some more, and then some more, and even more. But whichever way you cut it, the conclusion is inescapable, the universe must be teeming with life and much of that life intelligent and wise. So let me leave you with this thought about the meaning of it all. It’s this. It is said that the world reflects back what we think about most. As I hope to have shown, we can think our way into extinction, or we can think our way to more mystic and spiritual outcomes. The meaning of life is whatever you ascribe it to be. In the end, if we screw up this planet as place for mankind to prosper and grow, it’s no big deal. There will be many other humankinds out there in the universe who have taken a different route.